KNOM has been honored with the �Radio Station of the Year� Gabriel Award -- for the third year in a row! We were delighted but stunned when we heard the news. You can imagine how excited we are! August 8th, general manager Tom Busch will be in Montreal, Canada to accept the award, not only on behalf of the KNOM staff, but especially on behalf of our contributors. It�s you who make this award-winning Catholic radio station possible in the wilds of Alaska. We had only short notice. If you�d like to attend, please contact Tom immediately. NET INCOME (left): 180 miles south of Nome, Sonny Beans carefully mends his fishing net along the bank of the Andreafsky River. In bush Alaska, salmon account for many family meals throughout the year, and the income from commercial catches, perhaps several thousand dollars a year, can be the lion�s share of a family�s cash income. WELCOME TO NEW VOLUNTEERS Jodi Engle, Kevin Glynn and Vicki Muzik, who began one-year hitches of service in June. Photos below! WOUNDED BEARS: It�s a banner year for grizzly bears, with numerous reports of sows bearing twins and triplets, and among the public service announcements you�ll hear on KNOM these days are warnings of troublesome or wounded bears. Most of the immense predators avoid contact with humans, but there always seem to be a few troublemakers. Many of our mission�s friends, and the staff of the station itself, have remembered KNOM in their wills. For most of us, it�s possible to make a bequest that is far larger than any financial contribution we could make during our lives. If you�re revising your will, please consider adding missions like KNOM as beneficiaries. All contributions received from wills and trusts are placed in either KNOM�s small endowment fund, our improvement fund, or our emergency savings. May God bless you! INSPIRATIONAL SPOT: Prayer is the key of the day and the lock of the night. From Chicago, Kevin�s in training to supervise KNOM�s special feature programming. LEARNING THE ROPES: New volunteers (from left) Vicki Muzik and Jodi Engle get their first tour of KNOM Studio A from volunteer Connie Fessel (far right). The two arrived in mid-June, Vicki from Chagrin Falls, OH and Jodi from Long Prairie, MN. 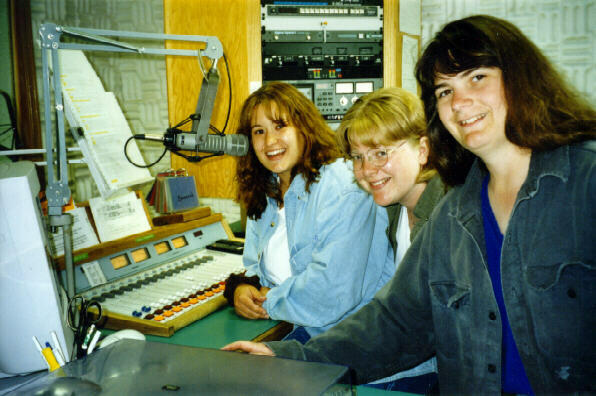 Within days, Vicki was assigned morning deejay duties, with Jodi reporting and anchoring news. Native children in bush Alaska are more than twice as likely as children elsewhere to die from injuries or be seriously hurt. By far, the greatest cause of injury hospitalization and death is suicide. The teen violent death rate in the KNOM listening area is more than three times higher than it is statewide. Child abuse among the Native population is more than double the Alaska average. As grim as these statistics from the governor�s office seem, things appear to be far better than they were before KNOM signed on the air, when the regional suicide rate peaked at approximately twenty times the national average. At the KNOM mission, we continue to slowly chip away at the many problems in this vast region. Thank you for helping to provide a 24-hour positive voice that touches so many lives. TWENTY-FIVE YEARS AGO: In July 1973, a 48-year-old man from Oakland, CA set onto the treacherous Bering Strait from the village of Wales, headed for the Russian coast--in a bathtub. As you might expect, he didn�t make it very far, although he did survive, according to KNOM�s news coverage. FOLLOW-UP: We�re sorry to report that the baby walrus rescued from the ruins of the mining train east of Nome died at the Tacoma zoo nine days later. The pup, caught in a tangle of metal, had been alone for several days, and despite heroic efforts, couldn�t muster the strength to survive. INSPIRATIONAL SPOT: The one thing that does not abide by majority rule is a person�s conscience. But one person with courage and conscience makes a majority. top BARGING IN: With the ice gone for a few months, it�s always comforting to watch the oceangoing barges pull alongside Nome�s long causeway. For most goods, the going rate from Seattle is about 15 cents a pound, approximately one-third of the air freight rate from Anchorage. Because of Nome�s remote location, the cost of living is 60% higher than the US average. Even more isolated, many villages suffer costs that are 2-½ times greater than those in the Lower 48. Looking for an �angel�: Reports continue to filter in that our power increase to 25,000 Watts has made a tremendous improvement in our signal, especially in our deep fringe areas, as we had hoped. Still, there are many places which need a little extra help to receive us. We�d like to make it easy for them. Recently, we�ve been considering the possibility of a contest, by which we could get 200 sensitive radios and antenna boosters into the hands of distant listeners. This would cover only a small percentage of homes who would like to receive us, but it would encourage even greater interest in our signal, and could begin a large long-term increase in distant listenership. The cost of a �mega-contest� like this would be approximately $16,000, including shipping costs. Do you know someone who might be interested in investing this sum into western Alaska KNOM listenership? DEAR ANONYMOUS: We remember you with fondness and gratitude. While you wish to keep your kindness to our mission between you and Our Lord, we know that your generosity will be greatly rewarded. INSPIRATIONAL SPOT: We must learn from the mistakes of others. We can�t possibly live long enough to make them all ourselves. INSPIRATIONAL SPOT: Without Jesus we face a hopeless end. But with Jesus, we have endless hope. top (Left) �CRABBY� is not a word you�d usually employ to describe KNOM Spiritual Director Fr. Mark Hoelsken, SJ, who was scheduled to visit KNOM for ten days in July. 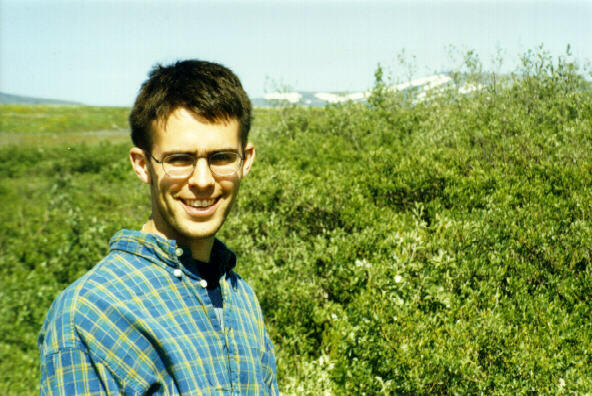 Father Mark serves as pastor of the remote villages of Toksook Bay, Newtok and Chefornak. Before entering the seminary, he was KNOM�s volunteer chief engineer. 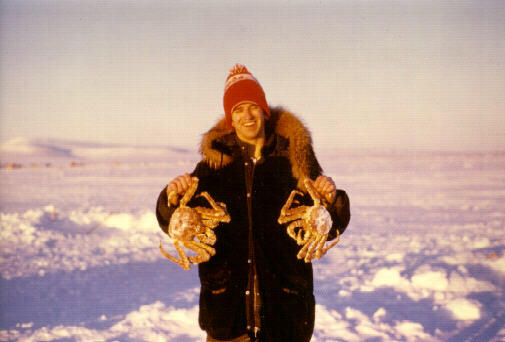 In this photo, taken twenty years ago, he displays a couple of winter�s treats, plucked from the Bering Sea. Every summer, a handful of hardy KNOM supporters, on tour through Alaska, drop by the KNOM studios to say hello. If you�re traveling this way, please come and see us! If you provide a little notice, we might be able to tour you around town a bit. CLEANUP: The villagers of isolated St. Lawrence Island are talking these days about asbestos, remnant of military installations on the island. You�d think that such a far-flung spot would be pollution-free, but it was only last year that the government finally removed miles of wire that had been ensnaring reindeer, and they have yet to clean up a 180,000 gallon spill of diesel fuel into an island stream. In the heart of KNOM listening country, about 150 miles southwest of Nome, the Siberian Yupik residents of St. Lawrence Island live largely subsistence lifestyles, close to the culture of their ancestors. THUS FAR DURING 1998, KNOM has broadcast about 17,000 inspirational spots, 17,000 educational ones, too, daily prayers and Rosary, Sunday Mass and 24 hours of news and companionship a day. Thank you for making this award-winning mission possible! SPECIAL THANKS this month to Les Brown, news anchor, engineer and wizard at repairing �crashed� computers, and to Ross Tozzi, helping out during leave from Mount Angel seminary in Oregon. You can be proud of all of the generous individuals who work together to keep this mission on the air. We thank you for your financial support, and also for your prayers on our behalf. We keep each of you in our prayers as we work together to beam the word of God�s Love throughout arctic Alaska. God bless you! INSPIRATIONAL SPOT:You are a child of God. Call home!